Indian bowlers put up a dominant display on Day 4 to crush a struggling Sri Lanka by an innings and 239 runs to register an emphatic victory in Nagpur. In reply to India’s first innings total of 610/6, Sri Lanka failed to muster enough steam and were bundled out for 166 in the second essay. After a display of guts and glory in the first Test match at the Eden Gardens, normal service was resumed at the VCA Stadium in Nagpur as the visitors failed to survive in front of the Indian spin bowling duo of Ravichandran Ashwin and Ravindra Jadeja and bundled out for a paltry score of 205 runs on a wicket that seemed a typical Jamtha wicket. Although Dimuth Karunaratne and Dinesh Chandimal - Sri Lanka’s best bet for the spin-friendly conditions thanks to their ability to play with a dead bat - struck fifties while other batsmen, including the senior statesman Angelo Mathews, failed to provide any noteworthy contributions to the team against the attack that left out their two best pacers - Bhuvneshwar Kumar and Mohammed Shami - for the game. In reply, the hosts, once again, lost the wicket of KL Rahul cheaply and finished on 11 for 1 at stumps on Day 1. After the failure to put up a good score on the board, the task was cut out for the visiting bowlers, but Cheteshwar Pujara and Murali Vijay defied all their tricks with a stoic display of batsmanship and put the Lankan bowlers’ patience to test. While Vijay was oozing class with his front-foot shots against the pacers, Pujara was a treat for the purists’ eyes. 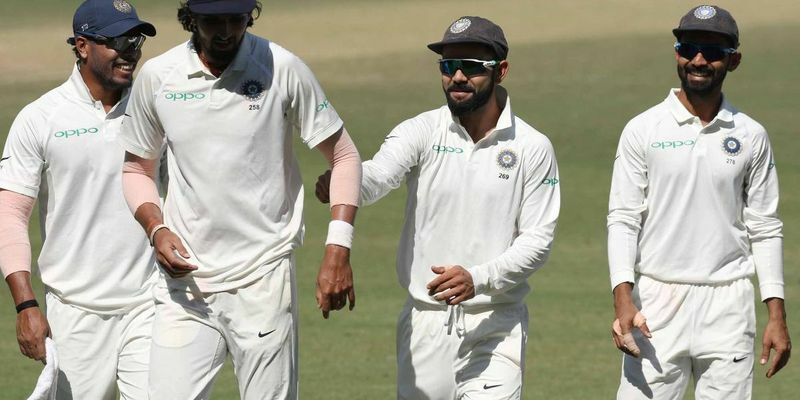 Although the run-scoring was slow, they didn’t play any loose shots unlike their counterparts and added 209 runs for the second wicket before Vijay played a reckless shot to get out for 128. Virat Kohli came out to bat in the final session of the day and entertained the fans with some classy strokes that took India to 312/2 at the end of day’s play. If Day 2 was all about the classic demonstration of the perfect art of defensive and prodding Test cricket, Day 4 was the illustration of how to pace a Test innings. Kohli didn’t have to break any sweat in order to pile pressure on the Lankans as he found run-scoring easier than ever. After completing his 19th Test century, he went on and on. After the dismissal of Pujara, Kohli joined hands with the comeback man Rohit Sharma and the duo combined to pulverize the bowlers. Rohit took a special liking towards Rangana Herath, stepping out at will and hitting him for boundaries. Kohli also paced his innings in the second session, scoring 47 runs off 62 balls he faced in the session. In the third session, he was even more attacking as he took only 36 deliveries to go from 170 to 200 to bring up his fifth Test double century. As soon Rohit completed his century, Kohli declared the innings with India at 610/6. That proved to be the right decision as Ishant Sharma got the better of Sadeera Samarawickrama in the evening to send the visitors to a lot of introspection. For all the talks surrounding Sri Lanka’s nadir, Day 4 of the Test put forward a frightening illustration of that as no one apart from Chandimal, to an extent, was able to face the Indian bowlers with any sort of authority. The day started with the dismissal of Karunaratne and then it seemed like a stroll in the park for the Indian bowlers. There was no resistance, no prodding mentality, and literally nothing from the Lankan batsmen to at least get to a respectable total. All they did was provide the Indian fielders with a glorified catching session. Chandimal although remained successful in striking a fifty-plus score, he was largely subdued by the spinners for the major part of the innings. Sri Lanka eventually managed to score 166 runs that presented India a 1-0 lead in the series.